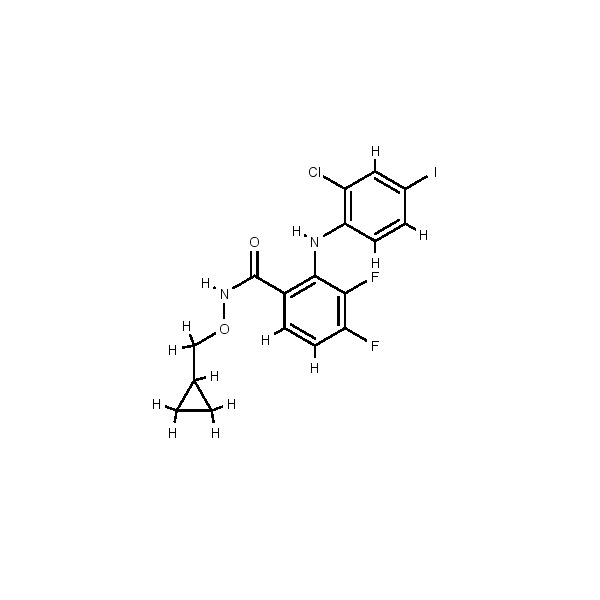 Background: PD 184352 is an orally active, highly specific, small-molecule inhibitor of MEK1. It is not competitive for ATP in vitro and it exerts its inhibition via an allosteric mechanism. PD184352 can block the activation of MEK by Raf, as well as inhibiting the active (Raf phosphorylated or mutationally activated) form of the kinase with an IC50 value below 20 nM. Although no inhibition of JNK/SAPK, p38 was detected, activation of MEK5-ERK5 pathway was inhibited at micromolar concentrations. Sebolt-Leopold JS. (2000) "Development of anticancer drugs targeting the MAP kinase pathway". Oncogene 19(56):6594-9. Raymond R. Mattingly, Janice M. Kraniak, Joshua T. Dilworth, Patricia Mathieu, Beverly Bealmear, James E. Nowak, Joyce A. Benjamins, Michael A. Tainsky, and John J. Reiners, Jr. (2006) "The Mitogen-Activated Protein Kinase/Extracellular Signal-Regulated Kinase Kinase Inhibitor PD184352 (CI-1040) Selectively Induces Apoptosis in Malignant Schwannoma Cell Lines". J Pharmacol Exp Ther 316(1):456-65. D. Y. Mitchell, J. M. Reid, R. E. Parchment, M. B. Meyer, J. S.Leopold, R. Herrera, J. R. Piens, L. M. Bruzek, L. J. Hanson, K.Van Becelaere, T. Carlson, C. Packard, A. A. Adjei, and P. M.LoRusso. (2002) "Pharmacokinetics (PK) and pharmacodynamics (PD) of the oral MEK inhibitor, CI-1040, following multiple dose administration to patients with advanced cancer." Proc. Am. Soc. Clin. Oncol. 21:81. Dai Y, Yu C, Singh V, Tang L, Wang Z, McInistry R, Dent P, Grant S. (2001) "Pharmacological inhibitors of the mitogen-activated protein kinase (MAPK) kinase/MAPK cascade interact synergistically with UCN-01 to induce mitochondrial dysfunction and apoptosis in human leukemia cells". Cancer Res. 61(13):5106-15.